After a strong five-year run, political realities caught up with the defense giant late in the year. 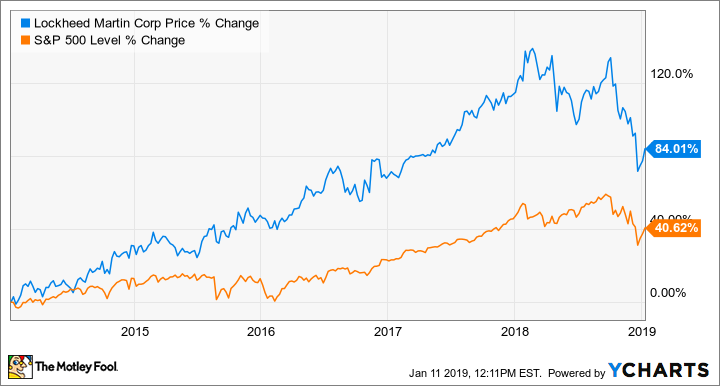 Shares of Lockheed Martin (NYSE:LMT) fell by 18.4% in 2018, according to data provided by S&P Global Market Intelligence, as a multiyear defense rally turned flat and then downward due to growing fears about future Pentagon spending. Lockheed shares had been top performers going into 2018, with their value more than doubling between the start of 2014 and the first quarter of the year. The rally followed years of curtailed Pentagon budgets due to spending caps imposed as part of an impasse in Washington. It was eventually fueled in part by the prospect of single-party control of the White House and Congress and the expectations that a deal would follow. LMT vs. S&P 500 5-year chart data by YCharts. Most of Lockheed's 2018 sell-off occurred late in the year as investors calculated how the mid-term elections could alter the power structure in Washington. The partial government shutdown in December validated those concerns. Lockheed also delivered some unexpected news in December when Chief Financial Officer Bruce Tanner announced his retirement. Though there hasn't been any suggestion of irregularity, Tanner is well regarded for his candid communication with investors and his expertise managing Lockheed through a series of divestitures and acquisitions. Tanner is staying on with the company until mid-2019, but any high-level transition like this one is bound to create some uncertainty. Lockheed Martin, the world's largest defense contractor, has a fantastic and increasingly diverse portfolio of businesses that will weather any downturn. There is nothing about this company's fundamentals that would justify the 2018 stock performance. Lockheed Martin-built F-35s and F-22s are part of a well-rounded portfolio of armaments. Image source: Lockheed Martin. That said, the near-term outlook is questionable. Even assuming the partial government shutdown is eventually resolved, lawmakers in the months to come face the herculean challenge of agreeing to a larger fiscal 2020 spending bill. If they can't forge a compromise, the spending caps of earlier in the decade will return, potentially cutting Pentagon spending by upward of $100 billion annually until resolved. For long-term investors with some tolerance for turbulence, there is no reason to run for the exit. But it would not surprise me to see Lockheed shares fall further in the months to come as the Washington budget battle plays out. Check out the latest Lockheed Martin earnings call transcript.